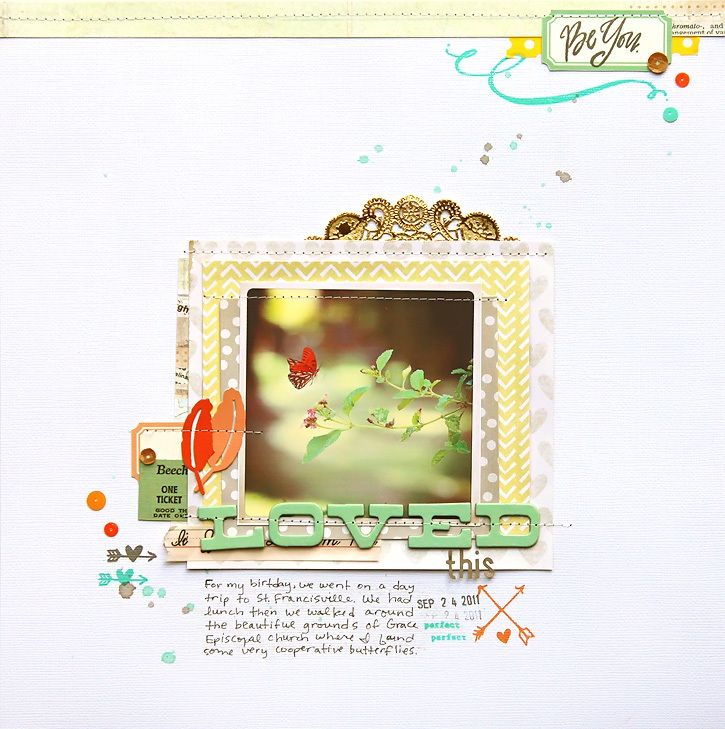 The October class at Studio Calico, Cutting Edge, is all about using your Silhouette! I took the first Silhouette class last year at Studio Calico and learned so much. In fact the first class is the reason I decided to purchase a Silhouette, and that was a very smart decision. 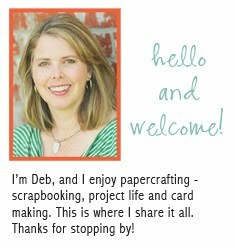 I have used it a ton, and really, scrapbooking wouldn't be nearly as much fun for me without it! Today is the very last day to sign up so don't wait! The sign up page is here. The class will be taught by Susan Weinroth and will include PDFs each Tuesday and Thursday in October. There will be four videos and step by step tutorials and over 30 new projects from the class contributors. Students will have access to a class message board and gallery. The Cutting Edge class is $29 and comes with a class kit while supplies last. 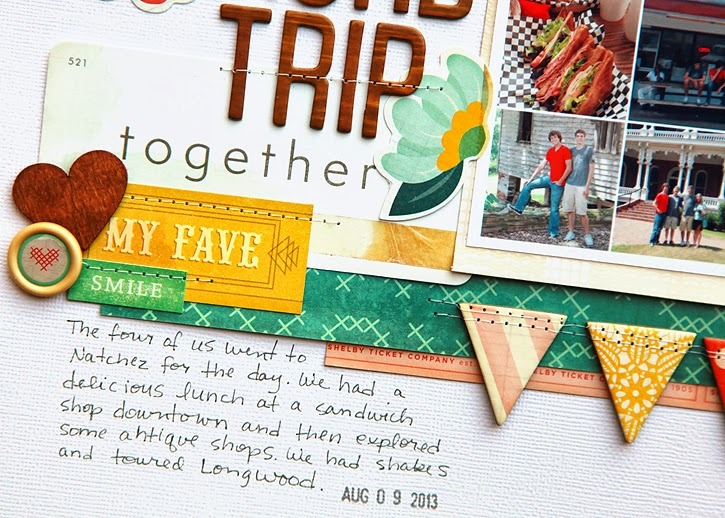 The kit includes a stamp and fun materials to cut - navy and turquoise vellum, Silhouette chipboard, printable gold foil, and double sided adhesive. 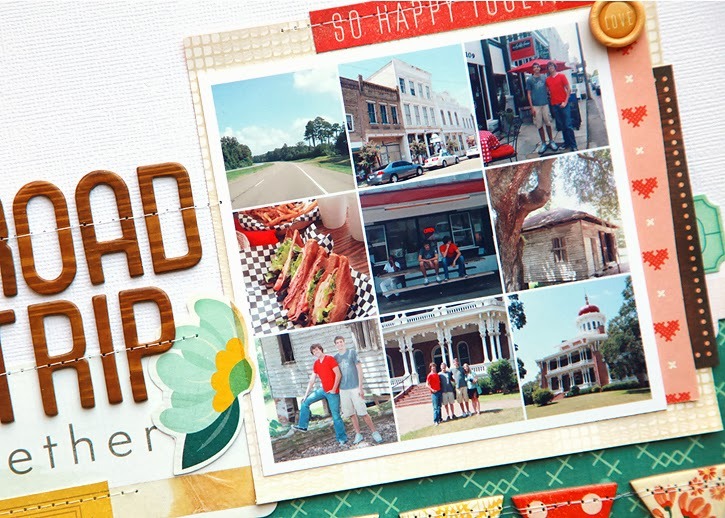 You'll also get a $10 download card for Studio Calico digital cut files. All students will receive digital files by In A Creative Bubble and a digital version of the class stamp including .studio, .abr and .png files. These have to be the happiest cut files we've ever had for a class! So cute!! Class starts tomorrow! Hope to see you there! Studio Calico's October kits, Antiquary are up for presale now for subbers and will go on sale for non-subbers at midnight Eastern time. 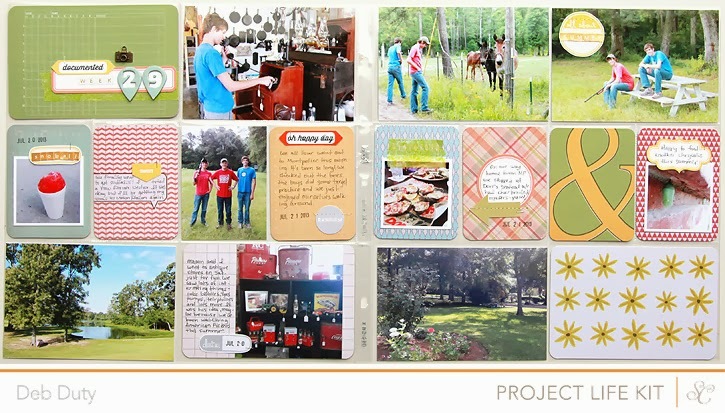 I made three Project Life spreads plus a layout for the last page of my first album now that I've filled one up! I always choose a color palette for each of my spreads, and I sure had fun with the colors this month! I love the greens and blues together, and the reds and yellows too. Clicking on the photo will take you to that project in my Studio Calico gallery where you can see close up shots and which kits I used. Hi there! I'm back with a couple layouts that I made with Crate Paper's new Close Knit collection. This is such a cute line with beautiful colors and lots of really great embellishments. I especially love the wood veneer shapes! The first layout documents a road trip we took a few days before school started. I used a collage so that I could include lots of iphone photos from that day. This collage is part of a collection of collages that you can download for free at GingerPixel. They require Photoshop or PSE. If you don't have either of those programs you could use a phone app like Pic Collage or PicFrame to make your own collages. 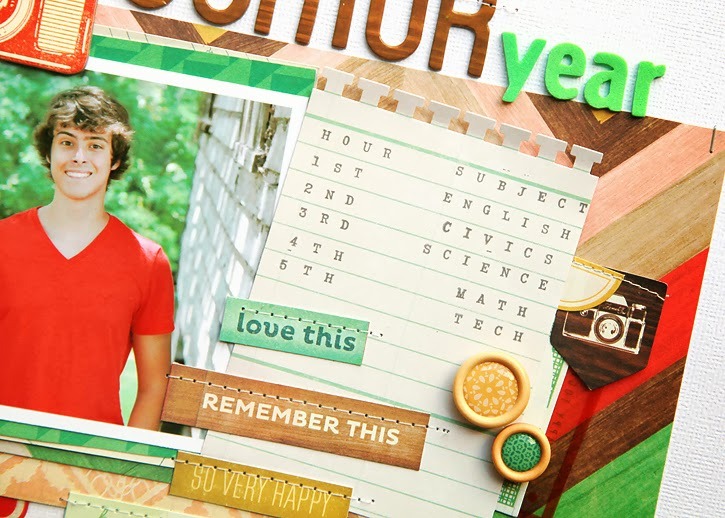 The first is a layout with a photo of Alec that I took right before he started his senior year. I used the Pebbles alpha roller stamp that was included in the Double Scoop Project Life kit to list out his schedule for this year. I love when I find a subtle patterned paper that's great for a background, but I could be happy just using white all the time. I love how the colors pop off of the white background. I use American Crafts cardstock available at Studio Calico here. 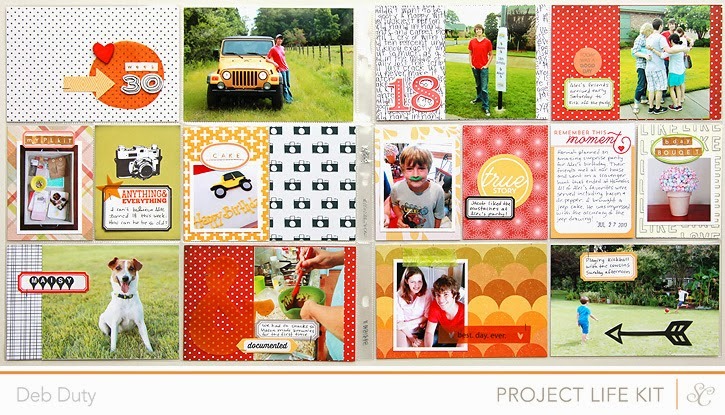 Last week I had an assignment from Crate Paper to create a layout about a favorite summer memory. I immediately thought about our trip to the beach and how much fun we had just being together and something Alec told me at the end of the trip about it being our best vacation. I used The Pier to create this layout and cut the title with my Silhouette. I have to admit that sometimes I regret adding mist to a layout because you never really know how it's going to turn out and I always do it at the end. I like the subtle little dots this time and those colors are so pretty! One has been out for a while and is called Taxi. The other is new and is called Sky. 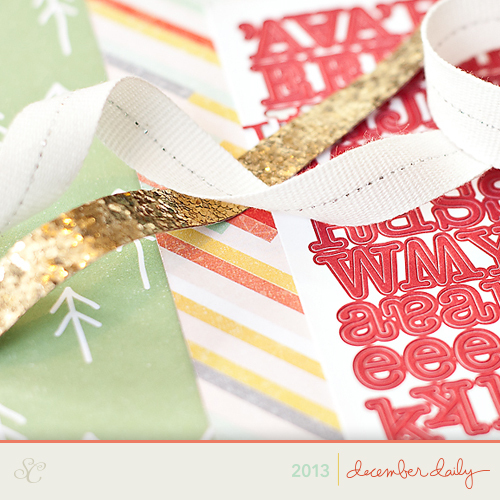 studio calico december daily sneaks!! Are you ready to start thinking about your December Daily kit? I may not be ready for Christmas, but I am ready to think about how I'm going to document it! 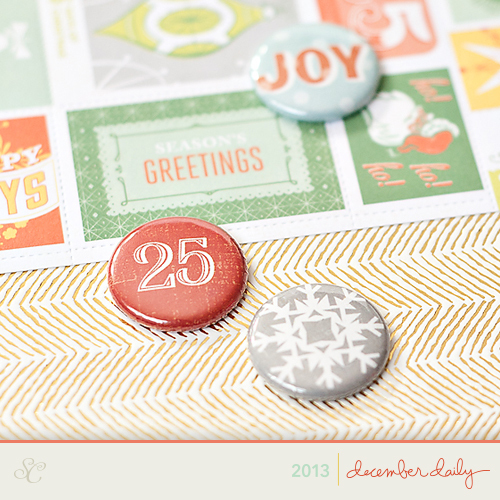 The Studio Calico December Daily kit is up for preorder now! The kit is $99.95. You can reserve your kit with a deposit of $25, and pay the rest when it ships at the beginning of October. I love that it's shipping earlier this year so we'll have lots of time to prepare! You will find a list of what's included on the preorder page. Here are some sneaks of a few items! The colors are beautiful and exactly what I would have chosen if I had picked them out myself... fun, but not too bright with some surprises thrown in. I love mixing a little orange with my reds and aquas! Of course there's also a stamp included... my favorite part!! This year's stamp is so cute and very versatile... I cannot wait to start playing with it! 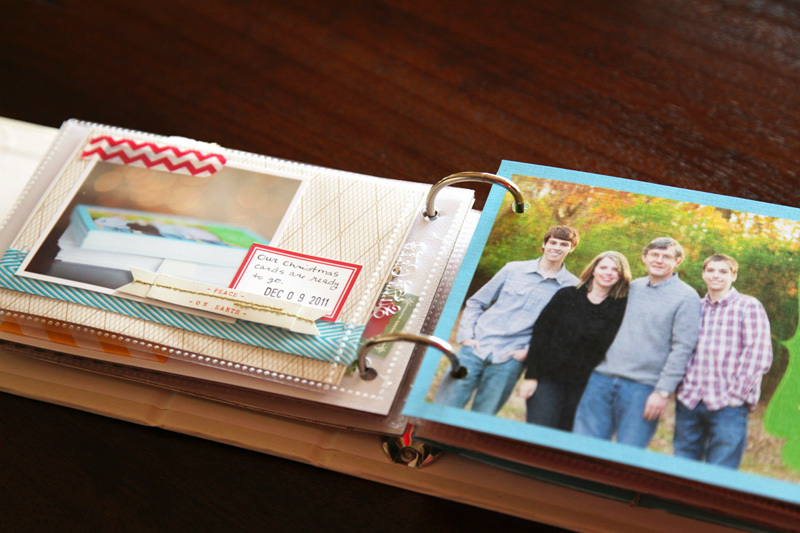 This time the album is a handbook and it comes with 31 page protectors in various styles. 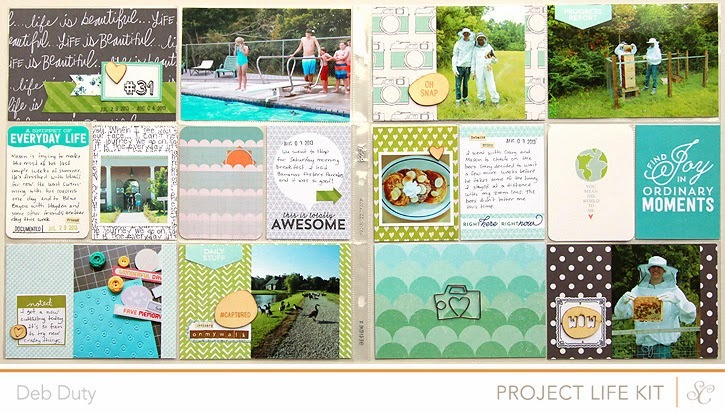 These albums hold a lot so there will be plenty of room for your photos, journaling and embellishing! I plan on painting the bare chipboard with acrylic paint... maybe white, and I'll also add a title and embellishments. 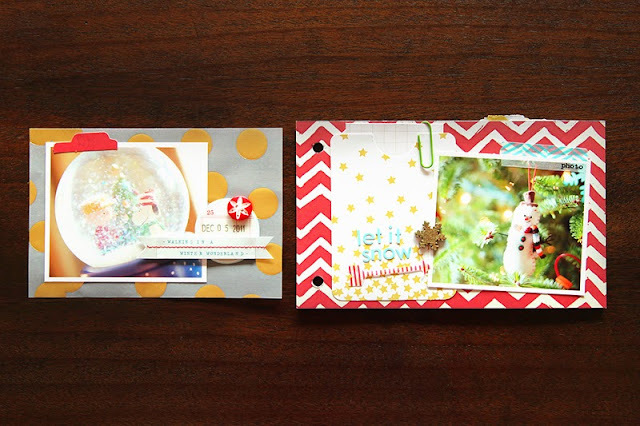 Last year I used Studio Calico's kit to make an album about our 2011 Christmas season. So I still haven't scrapped Christmas 2012. I'm still deciding if I will use this year's kit to go back to 2012 or to scrap the current year in real time. I will decide as it gets closer and I'll be sharing my progress here! I had so much fun using the kit last year! Everything came together perfectly and with ease. Here are a few pages from my 2012 December Daily album. Picking out the tree and putting it up will probably be the first part of my album again since we usually get it right after Thanksgiving. 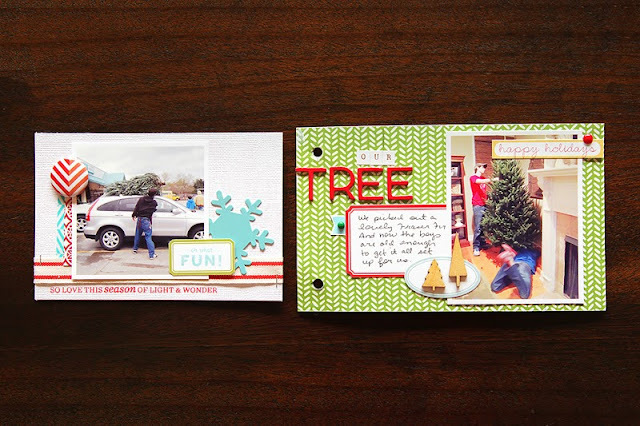 I don't worry if it doesn't happen in the month of December... the picking out of the tree will always go in my album! I always include close-ups of decorations of decorations around the house, some that are new, and some that have been with us for years like this Snoopy snow globe that my boys have loved since they were little. For last year's album, I took a photo of our Christmas cards all stacked up, and I punched holes in one to included as a page. If you're worried about being able to keep up with a daily record of your December, you can always just document the highlights like I do. I don't include something from every day, but I know some days will have extra photos, especially Christmas Eve and Day! To see more of my December Daily album from last year go here and here. 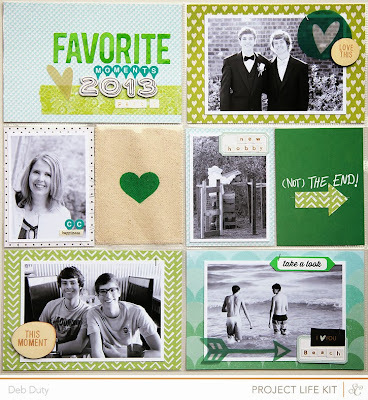 Studio Calico is having a blog hop today! Go here to see the list of participants. We are all sharing tips and ideas for putting together your December Daily! And don't forget to order your kit here! I have a new paper to add to my long list of favorites! The Presh Right Now paper from My Mind's Eye Cut and Paste collection is yellow with a little chevron pattern in white. 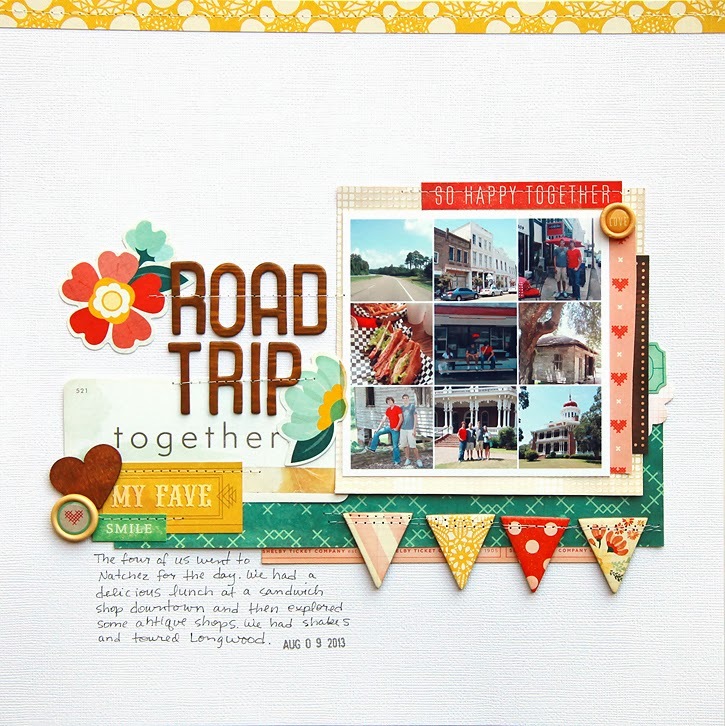 It's included in the Double Scoop main scrapbook kit along with some other gorgeous papers and embellishments! 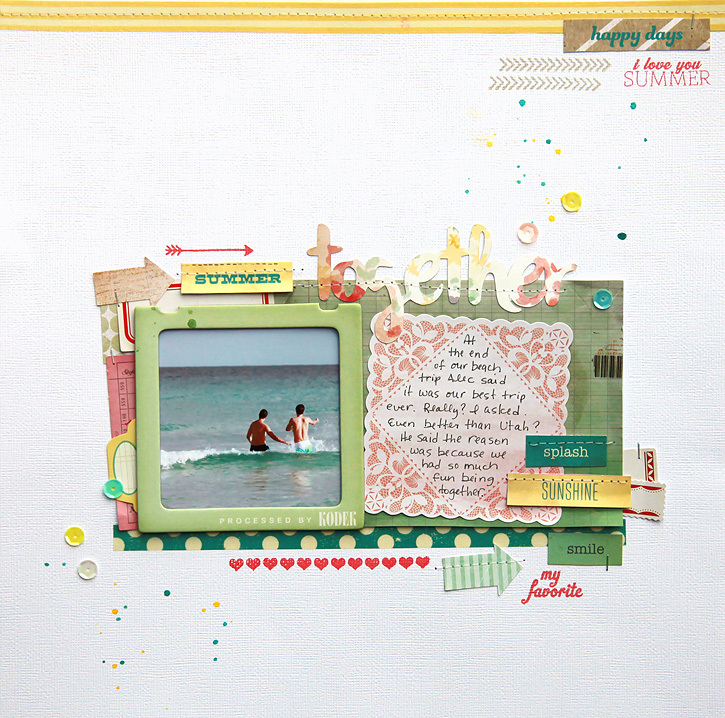 I used it for a background on this layout along with some cut files and those extra cute thickers by Amy Tangerine! Just a word of caution - those thickers seem like they're made out of rubber and my sewing machine didn't like them. I wouldn't recommend sewing over them, but if you do you'll probably have to turn the wheel by hand while pulling your paper through the machine. And you have to pull hard! That was the only way I could finish my stitch once I had started. 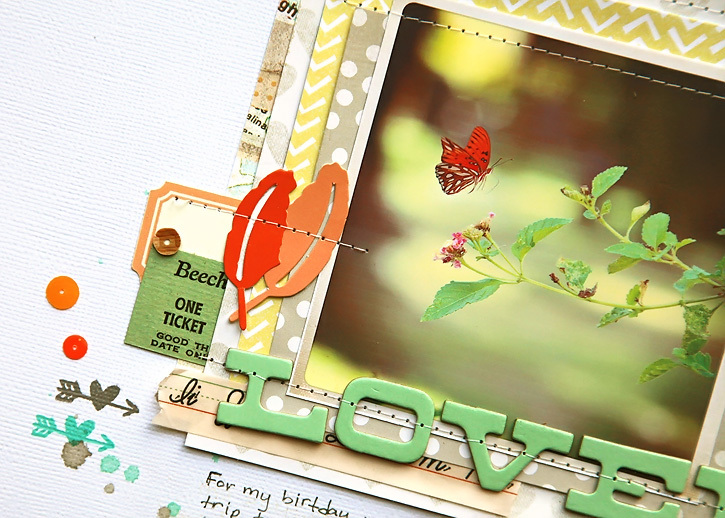 This layout includes one of my favorite butterfly photos with memories of a very fun road trip from a couple of years ago. I have to say I'm still loving my erasable pens. The first time I wrote my journaling on this layout it was too big and messy. I erased the whole thing and rewrote it. And I'm just now noticing I misspelled birthday. Looks like I need to do some more erasing... Love being able to do that! I mostly used the main kit on these layouts with just a few extra things - the yellow dot washi is from the Sprinkles add on and the green thickers and die cut feathers are from the Waffle Cone add on. 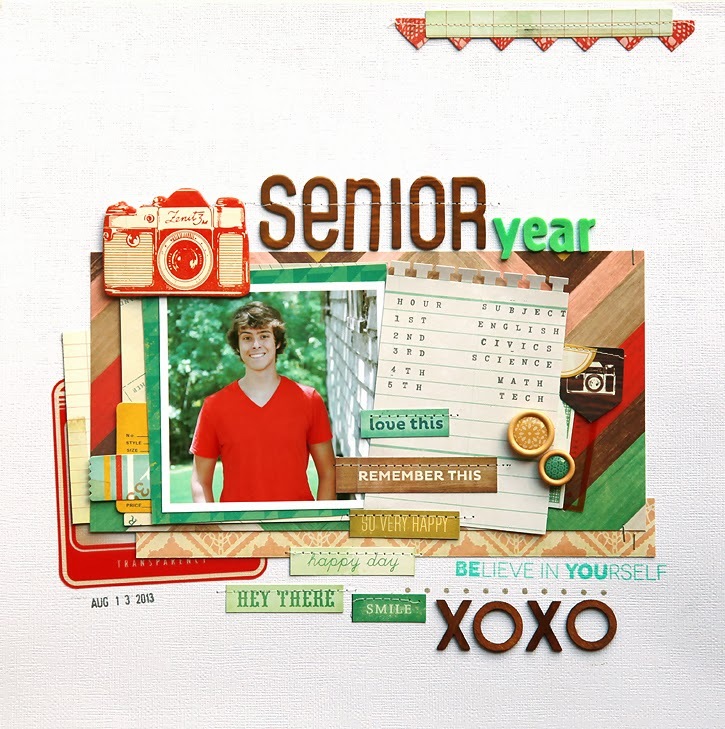 Plus I used the awesome stamp set by Lindsay Letters again! I also got some new Hero Arts shadow inks this month that I'm loving - orange soda and tide pool. Gorgeous colors! !